This Coffee Starter Kit features the Fresh Roast SR-340. A great coffee roaster with a 4.5oz capacity (perfect quantity for a strong 12 cup french press) and fan speed control. The fan speed control allows you to evenly roast the beans in about 6 minutes, wih a 3 minute cool time. Short and hot roasts (The Freshroast and i-Roast roasters fall into this category) tend to emphasize acidity and aromatics in a final coffee - whereas prolonged roasts emphasize body and complexity. The Freshroast is the most cost-effective mechanical roaster we offer and is very simple to use! For model specific information, check out the Freshroast product page. This kit also includes a stylish Bodum 8-cup French Press - a truly gourmet method of brewing specialty coffee. Also included is "Home Coffee Roasting: Romance and Revival" - an excellently written, incredibly informative, and authoritative book written by Kenneth Davids (a big name in the coffee industry). In conjunction with our quick tutorial on coffee roasting, included with the starter kit, you will be roasting like a pro in no time! 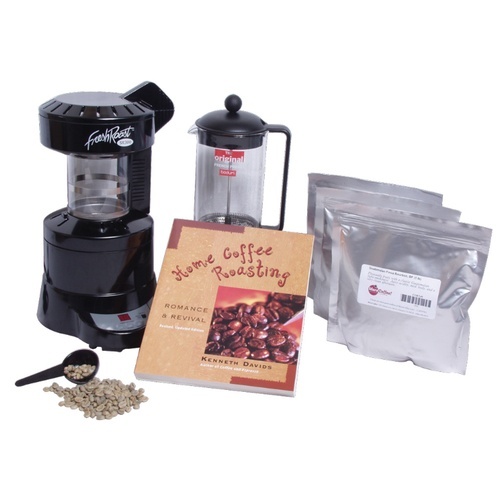 When purchasing a Coffee Starter Kit from us, keep in mind that you purchase more than a book and some equipment. Along with every one of our products we provide a wealth of knowledge and advice. Coffee tasting and roasting notes, product reviews, tutorials, experiment summaries, and phone or email customer support (advice, recommendations, assistance, and the like) are services that we provide at no extra charge. We are serious about quality coffee and products as well as excellent customer service. Your satisfaction is guaranteed. Three pounds of quality green coffee beans! Still unsure as to which roaster to start off with? Check out our Which roaster is for you? tutorial!